Did I leave you in the depths of despair about my fan grief last week? Sometimes a fan just needs to say what she feels, you know? This week, I’m focused on the good stories being written. There are great writers making new and amazing tales, creating new worlds and inspiring a reader’s fancy. In fact, this booklover is head-over-heels for the Kingfountain Series! Book 1 of the Kingfountain Series. 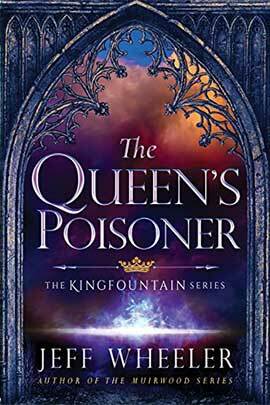 Jeff Wheeler’s first Kingfountain book, The Queen’s Poisoner, is a fantasy adventure with historic elements that captured my imagination from the first. Taken captive to the king’s palace, young Owen Kiskaddon (Don’t you love that name? The names in this book are splendid!) finds himself in a precarious situation. His father, a traitor to the crown, must pay for his betrayal with his life, leaving Owen’s life hanging in the balance. Feeling none-too-loyal to the king, he discovers Ankarette, the Queen’s Poisoner. Ankarette is the perfect ally… and a powerful enemy. She opens Owen’s eyes to the political upheaval going on around him, and in the process opens his mind to legendary powers he didn’t know existed! My book gifts came pouring in, and so did curiosity about this series. I had no qualms about sharing the first book with my kids. With its incredible, admirable characters of thought and deed, The Queen’s Poisoner is thoroughly laced with integrity and meaning. My daughter sat up reading it late into the night. How lovely it is when a mom and daughter get swept away in the same adventure! Another fascinating aspect of Wheeler’s first book premise is the influence of the historical account of the Princes in the Tower. The disappearance in 1483 of King Edward IV’s two sons, Edward V and Richard, remains cloaked in mystery to this day. While Wheeler’s story is completely his own, there are threads and names that surface, harking back to that murderous episode in England’s history. Take the name Dominic Mancini, the royal historian both for the true and Wheeler’s fiction. The Thief’s Daughter continues the historic thread. Piers Urbick surfaces as the disputed king of Ceredigion. His name sounds suspiciously like Perkin Warbeck, a claimant to Henry VII’s throne in the late 1490s who turned out to be an imposter. Wheeler’s handling of this imposter premise is quite intriguing! In fact, I think the second book is better than the first. Owen and his friend, Evie, have grown into young adults who mean much more to each other. His responsibilities require greater risks and sacrifices. Just how often does a sequel outshine its predecessor? If you’re a fantasy bookworm with a penchant for a strategy-filled clean read, this is the series to try! Book 3, Book 4, and the prequel, The Maid’s War, are also available on Amazon. Book 5 is in the works. Fan Grief. That’s what I’m calling it. It started with the Pride and Prejudice knock-offs (most of which should have been knocked off and buried before they aired), followed by the fairytales that underwent extreme makeovers. The old cartoons were revamped. Then the Muppets. (I just want to erase the Muppets from my memory forever because I hit an all-time low with the new Muppets.) The sitcom comebacks came back and left again to my relief. And then this: a little girl named Anne Shirley talks about sexual things she doesn’t comprehend, and it’s supposed to be amusing. It’s not. I’d be shocked, but that stage of my grief has been burned away by the constant barrage of terrible ideas coming from these revisits. Yeah, I know moral integrity was lost long ago by the major movie and TV companies who are making this tripe. That doesn’t make the horror go away that they have taken my childhood friend and smashed her innocent little face in the mud with the Boot of Demoralization. It doesn’t lessen the indignation I feel. Fan Grief, this sense of losing someone close, causes me anxiety, confusion, and anger simultaneously. Can we acknowledge Fan Grief is “a thing,” or is grieving over the loss of an imaginary person too unrealistic? We shouldn’t have feelings for anyone but real people, right? Book characters continue to relate to readers in ways and at susceptible moments when a real person couldn’t get through to us. Is it really so silly that we fans take imaginary characters seriously? Never mind that the worlds of imaginary characters change us, influence us to grow psychologically, open our minds to new perspectives. They aren’t real, so they don’t count. Are any fans mollified by this line of reasoning? It’s not working for me. L.M. Montgomery, the writer of Anne of Green Gables, wrote about seeing the beauty of life in the toughest situations and learning to rise above. She focused on joy through innocent Anne’s eyes. Later, as Anne grew into an adult, Montgomery used sorrow to create strength and vision to teach me to cling to love and goodness. Those of us who grew up scouring bookstores for Emily and Kilmeny and Marigold and Jane of Lantern Hill (before the Internet was an option) are now being punched in the gut. Our beloved Anne is a crude composite that some writer skimmed off the surface of Montgomery’s tale, tacking on to her all sorts of ugliness. What if someone re-manufactured the Teddy Bear by pouring dirt into him for stuffing, then touted him as the Teddy Bear I grew up with… and laughed with… and cried with? What if, in my excitement, I presented the new Teddy Bear to my excited daughter, who wanted to relate to my fond memories and stories? She would take the filthy bear in her arms, and he’d puff out his filth on her. Trying to connect with the experiences of her mother, my daughter would receive the gagging refuse the fake Teddy Bear left on her! It’s a sorry replacement: a fake Anne stuffed with sexual innuendo from a brutal past. This re-invented Anne suffers from flashbacks of abuse. She goes into a panic attack when a baby cries and relives being insulted, slapped, and beaten. She has a self-inflicted bruise along her forearm—because she’s “pinched herself a thousand times.” Maud Montgomery certainly depicted loneliness and even depression, but not in a masochistic manner. If she had written Anne in this grimy way, child readers would never have connected with her like they did. Adults – adults who have been through the horrors of abuse and neglect and brutality – connected with Anne because she inspired them to look on the bright things of life with new eyes. I can’t believe for a minute this is actually flying with fans. What fan is so unobservant and disloyal that she can’t see someone has just glued a picture of her favorite character onto something completely opposite in integrity to that character? Fans aren’t that stupid. I’m sickened! Yes, and I’m disgusted! And I admit that this strong reaction surprises even me. I’m surprised to find I’ve been wounded by a TV show. I don’t want the next generation to grow up thinking the book friends of my childhood even slightly resemble this rot. I want the next generation to know the wonder of the untarnished original, set in the thinking of the time, not a writer’s mind-child tattooed with anachronisms that ruin the whole experience! Didn’t that time have enough of its own problems; does it really need this era’s propaganda? Why do writers use historical TV programs to pick at the scab of modern day issues, preaching pet political opinions and spouting banal platitudes? It’s nauseating. I have a mind to put strychnine in the well these writers drink from because there’s no slate heavy enough to inflict on their heads the fury I feel over their senseless behavior.